As you may recall, we brought to your attention a new contest sponsored by Safecastle LLC. Specifically the contest asks for essays and video entrys on the subject of preparedness, self sufficiency and survivalism. We also provided a link so that you, our esteemed readers, could get information on the rules and the fourteen blogs where you could send your entries. Apparently you folks went there and took a look. In fact, a LOT of you went there. Yesterday we received an email from the folks at Safecastle. They had noted a lot of traffic coming from here to their blog. They also mentioned that they had originally planned for fifteen blog associates rather than fourteen, and would we like to take a place as the 15th? 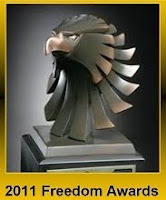 So we are now officially a participating blog in the Safecastle Freedom Award 2010-2011 contest. Once again, you can see their rules here. Folks, you are the reason this blog has seen the success that it has. And not to put any of the other participating blogs down (since I read most of them and enjoy them), we here at Rural Revolution have a somewhat different take on preparedness and self-sufficiency then a lot of the other blogs out there. We live the way we do because we think it's the best way for us, regardless of what is coming down the pike. And from what we hear from a lot of you, you agree with this philosophy. So. Want to write about the best kinds of ducks to raise or the best way to raise them? Goat keeping secrets? Building a better cistern? We'll post them. Want to make a video about why prepping is Godly? We'd love to see it. New to the whole prepping scene and want to tell us about your successes (and failures - we all have them)? Send it in! Got an idea for a better chicken tractor? (Yeah, I'm not real sure what it is either. I'm guessing it's a D8 with a processing plant that rolls over the flock and leaves cleaned, plucked, and wrapped birds ready for the freezer.) Let us post it. So. Here we go. Send in your pieces and let's start the discussion. Well, duh! (I'm sorry, was that rude? I'm trying to keep in mind the stipulations for posting comments, but my memory is short.) Let me begin again. Heck yes your blog should be on the list of qualifying blogsites for the contest. Gee, I would love to win one of those laser engraved tankards, but alas I have no skills, no talents, and no clue. Good luck to all RR readers who enter the contest. Looking forward to reading/watching your submissions. Congrats on your involvement! That's very exciting. I certainly found some good sites from where you directed us yesterday. I'm more in line with you guys (and Granny Miller my fav) when it comes to living this way on purpose not because it's the end of the world. My husband insisted that before we continued courting that I would STAY HOME with the children and also HOMESCHOOL them. Part of the deal. Sounded like my knight in shinning armor was here to rescue me from this world. Just this year my senses have been heightened as to where our country is really headed and I am now pushing him to help me get our property up to snuff. You are helping me with that. Thanks so much! You're one of the most vocal and prolific commenters here. And from all that I've read, you have a wealth of experience that we all could profit by. Please reconsider. Just write us a piece on your view of the world with regards to the hard times coming. I KNOW you have views on that! Or anything else that you are passionate about. 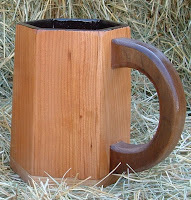 Besides, if we don't get more than 10 articles, you'll automatically be a tankard winner. You'd be helping us, the both of you, to break the ice. Yikes! I've been trying to post a reply for half an hour. Guess I shouldn't have uploaded IE9RC. Now I'm back to Internet Explorer Version 8, let's see how this works. Don, you're very persuasive. Although I admit to being quite vocal and prolific here, that doesn't necessarily mean I know what I'm talking about. The contest runs for the full year, so that will give me some time to learn something useful - then I'll give the contest a try. Yo, Don, I've got a submission for the Safecastle Freedom Award 2011 contest. Please let us know the correct email address to use. Thanks.